Prostate cancer is fairly common, with just over 1 in 10 men being diagnosed in their lifetimes. And while most men diagnosed will not die of prostate cancer, proper treatment is essential. If you are curious or concerned about your prostate health and want advice from a prostate doctor, contact Advanced Urology Associates in Orland Park, IL. We specialize in men’s health care, including prostate cancer hormone therapy for men of all ages. 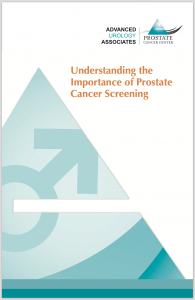 Starting at about age 40, men should seek prostate exams on a yearly basis. The prostate, a small organ located in the reproductive system, grows throughout a man’s life, and sometimes this growth can proceed unchecked, leading to an overly large prostate. If you don’t currently have a general physician, a prostate doctor at Advanced Urology Associates can perform examinations, ultrasounds, and biopsies as needed to determine the health of your prostate. If cancerous growths are found, early treatment can ensure that you stay healthy and are able to overcome this disease. With the help of biopsies, surgery, and prostate cancer hormone therapy, your chances of recovery are good. At Advanced Urology Associates, we provide high levels of care and comprehensive diagnoses for patients of all ages. Because we specialize in urological disorders, each of our physicians can provide expert care and advice. Contact us to schedule an appointment with a prostate doctor in Orland Park, IL at 815.409.4930 or request an appointment or a FREE screening today.